Your Safety. Your Mobility. Your Economic Opportunity. 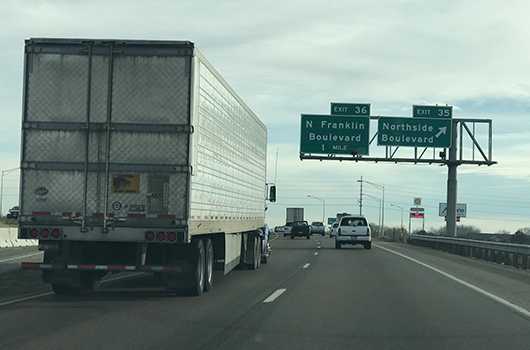 The westbound on-ramps at the Franklin and Northside interchanges will be closed on several occasions next week while the Idaho Transportation Department rebuilds the interstate shoulders near the ramp. The westbound I-84 on-ramp at Franklin Boulevard will be closed from 10 p.m. to 6 a.m. on Monday, Nov. 5 and Tuesday, Nov. 6. Motorists can use the ramps at the Garrity and Northside interchanges during the overnight closures. The westbound on-ramp closure at Northside Boulevard will occur from 8 p.m. to 6 a.m. on Thursday, Nov. 8. Motorists will be directed to use the ramps at the Franklin and Karcher interchanges during the overnight closure. ITD is widening the I-84 shoulders between the Karcher Road and Franklin Boulevard interchanges this fall in preparation for major construction next spring. Download the project fact sheet for details. To request email updates about construction activities, text 84CORRIDOR to 22828. For more information on the I-84 expansion project, visit itdprojects.org/i-84-karcher-to-franklin.